DAVINCI development A/S has entered Danish motorsport, where we have entered into collaboration with the Danish Thundersport Championship, for the development of bodywork for the motorsport series, based on high-end sports coupes. The development is centered around an Audi RS5 and a Mercedes AMG C63. 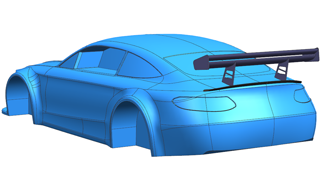 Following the 3D scans, the chassis are modeled in CAD software, as preparation for the CFD calculations. 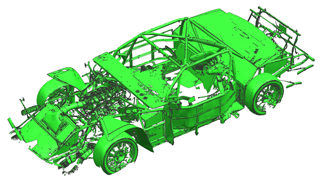 The process of modeling the chassis in CAD is described in this article. In this part of the project, the focus of attention is on adjusting the scanned data, so that the final result will still resemble the original. The models must be 150 millimeters lower and the wheelbase has to be about 100 millimeters shorter, whereas the front’s appearance has to be 1:1. Firstly, each of the scanned models must be straightened up laterally and longitudinally. Afterwards, the models are lined up with one another, where the wheelbase is used as a reference. Next, the models are modified so that they match the intended end result, with special attention paid to the models’ total height and the wheelbase. Hereafter, the models are cut into appropriate bits and resized. The new CAD-geometry, surfaces and solids, are modeled based on the scans. For most of the details, data has been pulled from the scans, as a basis for the CAD-geometry. 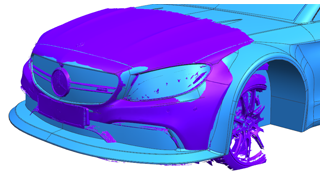 The modeling of the remaining data is done by eye, with the scanned models as reference. The geometries for each car are put together to create a solid model of each of the new cars. In addition to this, the solid models are adjusted, so that the details of the final shells can be designed. After this, the solid models are ready for CFD calculation, which is described in the next article.